The new Sheriff in Trouble, Texas, had a lot to prove. 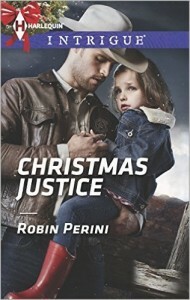 The last thing needed was a gorgeous CIA analyst getting in his way-at Christmastime no less! Trouble's newly minted sheriff, Garrett Galloway, is determined to move on from his traumatic past. But when Laurel McCallister tracks him down and begs for help, he can't say no to the smart, beautiful CIA analyst. She's desperate to find the assailant who killed her niece's family-and now wants her dead. On the run, Garrett, Laurel and her young niece escape to a Texas ranch, but danger follows. Garrett's courage lessens Laurel's initial distrust of the mysterious lawman and sparks fly in the remote cabin. Now he must succeed for more reasons than avenging Laurel's family.